Anyone wondering whether there might be a degree of artistry to what Roland Emmerich does should look no further than San Andreas, an earthquake disaster movie made in the Emmerich style, complete with divorced protagonist and obliterated landmarks, but lacking the blockbuster crafter’s sense of scale or knack for composing mayhem memorably. 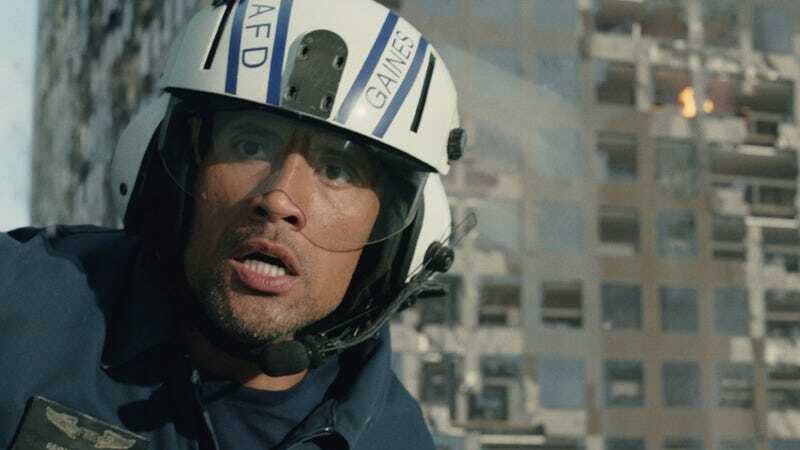 Handsomely shot by Steve Yedlin, Rian Johnson’s regular cinematographer, and boasting a typically likable Dwayne Johnson as its star, San Andreas nonetheless struggles to drum up tension or interest, even as skyscrapers topple like Jenga towers and massive tidal waves sweep through San Francisco Bay. 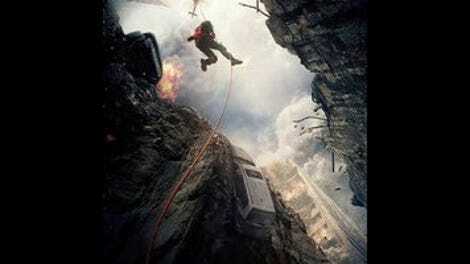 Johnson plays Ray Gaines, a Los Angeles Fire Department helicopter pilot who finds himself racing across California after a series of massive earthquakes and aftershocks leave ex-wife Emma (Carla Gugino) trapped in downtown L.A. and daughter Blake (Alexandra Daddario) pinned down in an underground parking garage in San Francisco. Barring a cool digitally composited long take—in which the camera flies in through the window of a shaking building and follows Emma as she makes her way to the roof—director Brad Peyton (Journey 2: The Mysterious Island, Cats & Dogs: The Revenge Of Kitty Galore) can’t seem to connect his characters to the destruction unfolding around them. Maybe it has something to do with the fact that he rarely frames them in wide shot, instead intercutting close-ups with all-CGI spreads of crumbling destruction, the scale thrown further out of whack by 3-D. Or maybe it’s just a lack of showmanship—that semi-disreputable P.T. Barnum craft of getting the audience primed to see a container ship crash into the Golden Gate Bridge, or making them appreciate the idea of a toppling high rise narrowly missing the heroes. Here, buildings collapse, millions presumably die, and a small handful of boring characters escape danger again and again. Meanwhile, Johnson flashes his winning smile and Kylie Minogue repeats her Holy Motors role by appearing in one scene that ends with her falling off a building. The script, by Carlton Cuse (Bates Motel, Lost), trades in Relatable 101 generics, framing a 9.5 Richter scale earthquake as the story of a nuclear family under attack, both from within (see: Emma’s rich new boyfriend, played by Ioan Gruffudd) and without. Even the above-average cast—with Paul Giamatti livening things up as the requisite concerned-scientist/exposition-delivery-machine—can’t seem to make it work as anything more than a series of reasons to get from point A to point B. Which should be fine, given that it’s how disaster movies generally play, but Peyton can’t sustain suspense past the first earthquake scene, set at Hoover Dam. After that, it’s hard to appreciate San Andreas as much more than a series of special effects vistas: impeccably detailed, completely plastic. A prop plane crashes into a mall full of looters, speedboats race to get over the swell of a tsunami before it crests, power lines hiss out sparks as they snap across a San Francisco hill, and it’s all staged in a way that somehow manages to look good without being exciting. By the point when an American flag unfurls to a rah-rah swell before the cut to credits, a viewer’s lizard-brain—the same part that appreciates parkour and clicky robots—has probably long checked out.